I was sitting with a friend at our favorite spot, Panera. We were chatting as we do when she asked me, "Have you always been confident?" I immediately said, "I am not confident now." I will be the first to admit that I often seek advice from others. I question myself at times. I am always pushing myself to find truth. Shortly after those words left my mouth, I retracted them because even though I may initially be uncertain I am confident in my decisions. I am working on speaking positive words over myself. Each day I am getting better. Her question did lead us into a deeper discussion, one that challenged me to reflect on my reasons for feeling unconfident. Before getting to this point in our conversation, we were talking about identity. We often talk about identity when we are together. Since this conversation, I've learned that the word identity was derived from a Latin word meaning over and over again. Now this was a game changer for me because I know that my view for feeling like one who lacked confidence came from allowing others to place this on label me. During my younger adult years, I gave some people power to speak such things into my life. I allowed people to say anything to me without putting up any sort of fight. I thought I was turning the other cheek, but actually I was allowing my identity to be crushed by hearing negative words over and over again. Before the words were spoken to me, I didn't feel like I lacked confidence. I allowed normal behaviors become scrutinized like uncertainty and seeking advice. I know that we all experience uncertainty because we never know what the future looks like. As far as seeking advice, I know that quite a few conversations I have with people fall under "What do you think about ... ?" So yes, I allowed normal behavior become something bad which contributed to me believing that I didn't have confidence. Confidence: (n) a sense of trust or faith in a person or thing, or in oneself. Just like identity, I have recently learnt the meaning of confidence. Some people saw my confidence by my actions while others denied it because of my actions. Because I lacked knowledge, I couldn't tell who was speaking truth and who wasn't. It's funny how a quick check in a simple dictionary can help correct error. The definition above comes from the American Education Children's Dictionary. It defines confidence very simply by stating it is having trust and faith in oneself. So now I ask myself a few questions that really help me determine if I have confidence as a whole. Do I believe in myself? Yep. Do I think I can get certain things done? I sure do. But, do I need help at times? Yes, and I don't see this as a lack of confidence. Honestly, we will all be uncertain in different areas of our lives especially if we are entering a new season. I am not sure how many moms are extremely confident when they bring home their first child or the number of people who enter their first day at a new job without a tinge of unsureness. Now, there are times when our uncertainty or our lack of knowledge can hinder us especially when we are supposed to press forward. We lean on the uncertainty as a crutch and hide from the "thing" that we are suppose to pursue full throttle. This often does directly impact the way we view ourselves and can be leverage for low confidence or low self-esteem to creep in. After pondering, today I am looking at myself through a different set of lenses. No longer will I my confidence to be determined by the words of others, but instead I will hang on to the confidence in which I have in Him. I see myself in His image, fearfully and wonderfully made. I don't have to have the confidence that the world seeks, but I am confident in most of the things I do because I know I am not doing any of it alone. 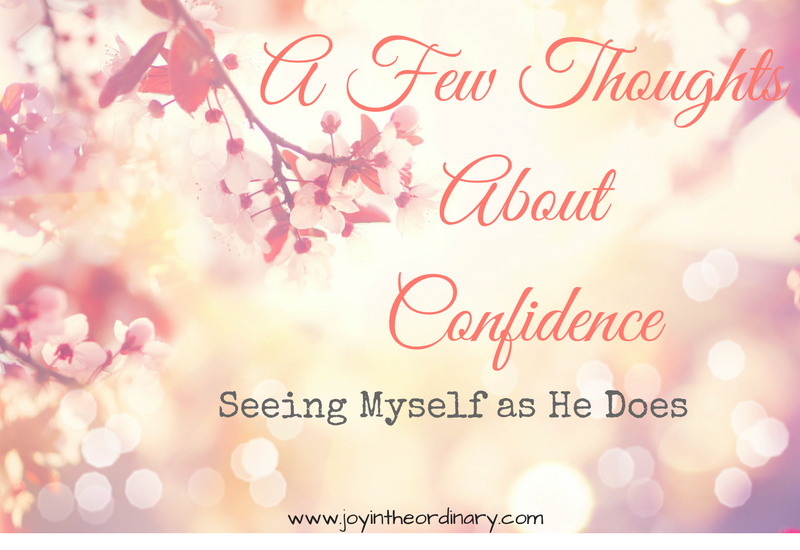 Our confidence can't only be in ourselves, but it truly has to be grounded Him. If we lean simply on ourselves, we will dwindle, but if we trust in the one who created us nothing else stands a chance. How do you gauge your confidence? Have you allowed others to control the way you see yourself?